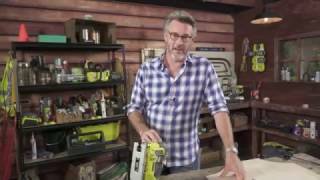 The Ryobi 600W jigsaw packs a lot of power and features into a small package, cutting through all types of wood, plastic, drywall and even metals with relative ease and accuracy. This versatile piece of equipment is a welcome addition to any handyman's arsenal and features an integrated LED light and included cut guide to help ensure the smoothness of each cut. Various speed settings give you optimum control and versatility while its four-stage pendulum action provides fast, precise cuts. Edge guide and carry case included. It has a cutting capacity of 85mm for wood, 20mm for aluminium and 9mm for steel. To see the Ryobi 600W jigsaw in action for yourself, or to browse Ryobi's range of quality power tools and hardware, call or visit your nearest Bunnings Warehouse to check availability. Always work safely The LiveTool Indicator is designed to help prevent accident or injury from accidental startup or other electrical hazards. A blue LED light illuminates when the tool is plugged in and power is available to begin work. For safety reasons, you should always disconnect your tool from its power source when removing or changing accessories (such as grinding discs, router bits or drill bits). This is helpful in preventing accidents and injury, and any safety feature added to a power tool is a welcome addition.